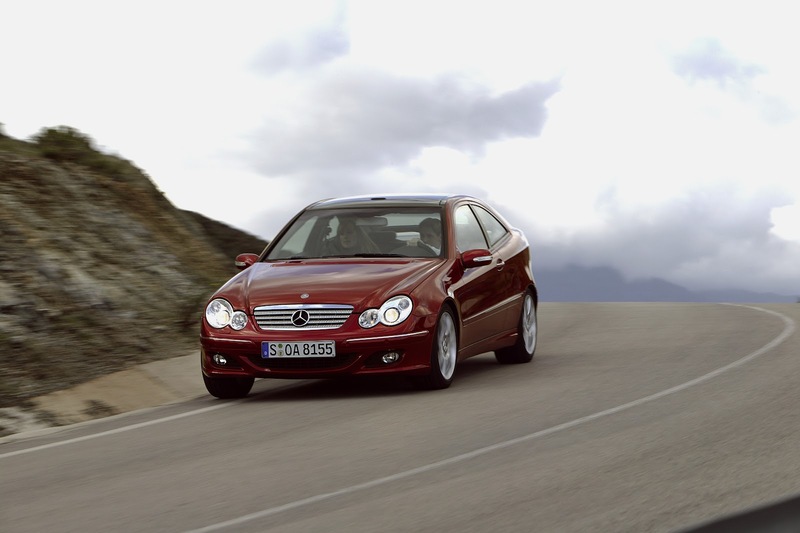 The new C-Class cast its first glance at the world in March 2000 through four dynamically styled headlights rather than two. For the third edition of the compact class, Mercedes-Benz came up with a particularly fresh and youthful styling – and the appealing looks were matched by a raft of technical innovations. This combination was the defining feature of the Saloon and also the Estate introduced in 2001, and the new Sports Coupé added a new arrival to the C-Class family in the fall of 2000. The Coupé was presented as a new body variant at the Paris Motor Show. The development of the new model series had taken four years and an investment of 2.7 billion DM (1.38 billion euros). Notwithstanding their sporty character, the previous two series had consistently demonstrated the Mercedes-Benz brand’s ability to transfer its characteristic brand virtues to the smaller category. The 203 series no longer had anything to prove in this area since the C-Class, with over 1.8 million units of the 202 series sold, had established itself around the world as a compact premium automobile. The success of its predecessor could have been a major challenge for the new C-Class, but the 203 series took this in its stride: the styling and engineering of the new model were winners right from the start, and the third-generation compact class became the bestselling model series of its kind in the history of Mercedes-Benz, with over two million vehicles sold by the fall of 2006. 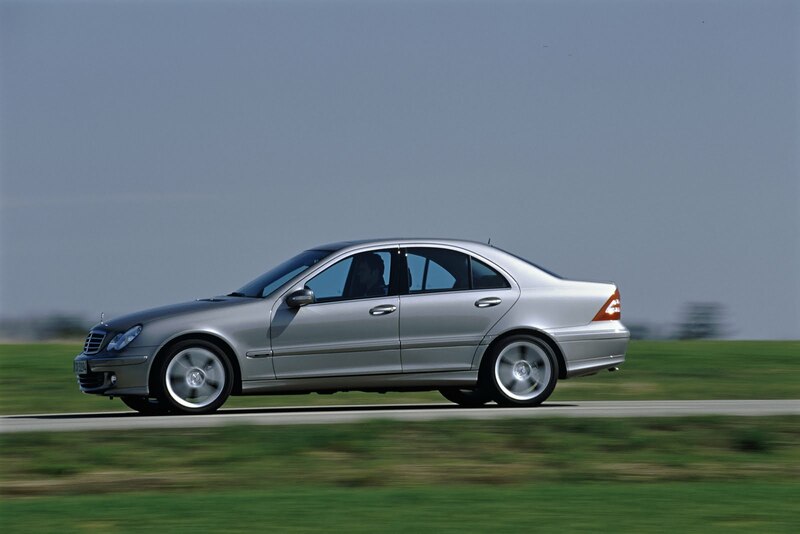 From its launch in 2000, the C-Class came with a comprehensive package of technical innovations as standard equipment that had never before been available in this market segment. 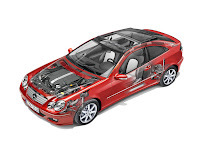 Mercedes-Benz engineers had accorded extra high priority to the aspects of safety and comfort. This leading-edge technology delivered on the promise of the visual styling with outstanding dynamism and motoring pleasure. The new-look design featuring a modern interpretation of the four-eye face immediately highlighted two of the major qualities of the new C-Class: dynamism and elegance. The Saloon was a youthful, progressive vehicle with the agility of a sports car, based on its newly developed suspension, more powerful engines, and innovations drawing on the latest technological advances. The C-Class combined this dynamism with qualities typical of Mercedes-Benz such as maximum safety, top quality, outstanding comfort and total reliability. The standard equipment of the new Saloon included some groundbreaking innovations previously available only in top-of-the-range Mercedes-Benz models: window bags, adaptive driver and passenger airbags, headlight assist, multi-function steering wheel, central display and fibre-optic cables were just a few examples of the innovations that meant that the C-Class, too, was now the technology leader in its market segment. A total of over 20 technical innovations from top-of-the-range Mercedes-Benz models were included as standard equipment in the new C-Class. Maximum safety was ensured by standard equipment including systems such as the ESP® Electronic Stability Program, Brake Assist, automatic child seat recognition, belt tensioners and belt force limiters on the front and outer rear seats, head restraints on all seats, side airbags in the front doors, the SPEEDTRONIC electronic speed limiter and six-speed transmission. The front-end structure of the new Saloon included a module with crash boxes made of high-strength steel, bolted to the rest of the body. This made the module easy and inexpensive to replace after a collision. In minor accidents at up to 15 km/h, the front module was designed to absorb all of the impact energy, leaving the structural members behind the module undamaged. 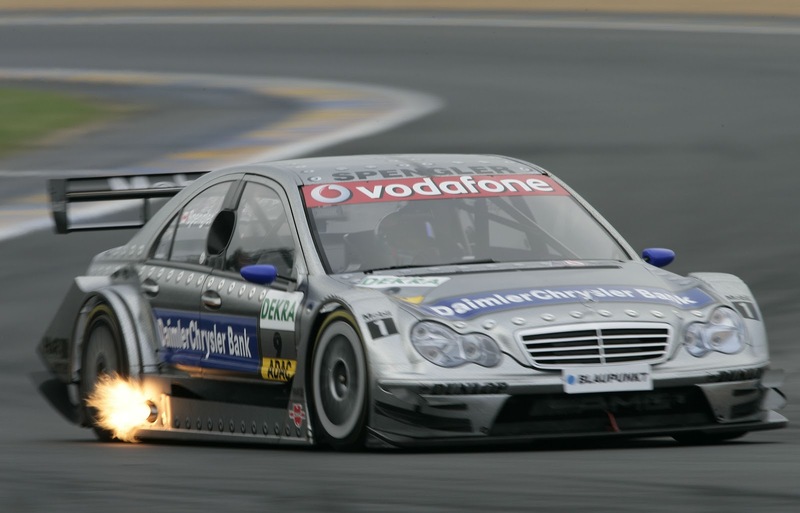 The Mercedes-Benz engineers had also developed a similar easy-to-repair structure for the back of the car. The axles, steering and brakes in the 203 series were either newly developed or enhanced. This resulted in outstanding agility, excellent directional stability and high-precision steering, minimal road noise and tire vibration, highly efficient braking, and safe handling even when approaching the critical limits. The suspension innovations included a newly developed three-link front axle with McPherson struts, state-of-the-art rack-and-pinion steering, and generously dimensioned disc brakes with enhanced cooling air flow for optimum braking comfort. 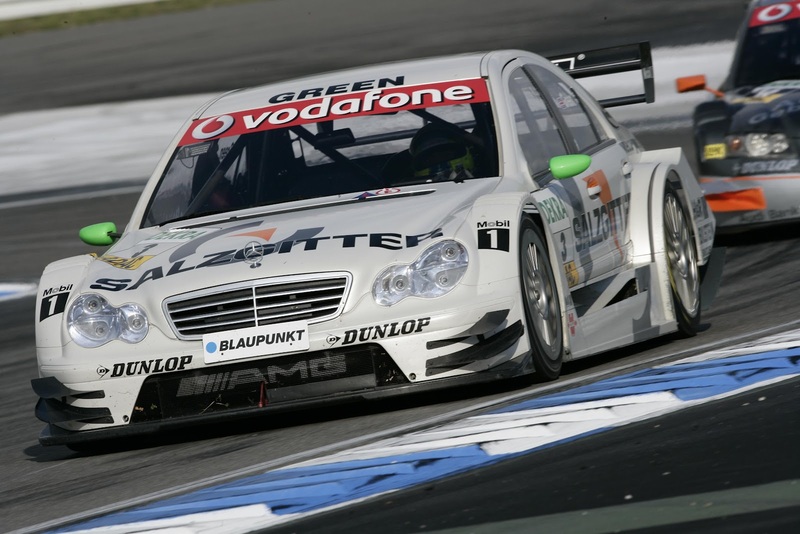 The W 203 also featured outstanding aerodynamic qualities, with a Cd value (drag coefficient) of 0.26 and up to 57 percent less lift forces at the front and rear axles. The Estate version of the C-Class presented at the North American International Auto Show in Detroit in January 2001 was closely related to the Saloon. The Mercedes-Benz designers had developed both body variants in parallel, and their front sections featured the same mix of sporty and elegant characteristics. The dynamic image of the Estate was highlighted by the long, distinctively styled roof with sweeping downward lines at the rear, which merge into the rear roof pillars set at a very flat angle. A discreet spoiler integrated at the top of the large tailgate contributed to the outstanding aerodynamic qualities and stability of the new Estate. The design emphasized the Estate’s independent status, without forgoing the acknowledged dynamism of the Saloon. The new Estate replaced the S 202 series in March 2001. Almost 250,000 units of the earlier model had been produced since the spring of 1996, with remarkable results in the marketplace, particularly in West Europe. Around one third of all buyers of a C-Class model had opted for the Estate, prompting the decision also to offer the new C-Class Estate for sale in the USA from September 2001. The car’s character as a hard-working lifestyle vehicle was further reinforced by the variable interior configuration. The S 203 was ideal for people with an active lifestyle, with differing transport requirements in their professional and private lives. The compact wagon provided anything from 470 to 1,384 litres of stowage space, depending on the position of the multi-functional rear seating unit. Seat squabs and backrests could be folded down in the rear as required, across the vehicle or on one side only, providing a flat cargo area of up to 1.5 square metres. The capacity of the largest box fitting into the trunk of the new Estate was 783 litres, eleven litres more than in its predecessor. Standard equipment included a removable shopping box and the newly developed, easy-to-use cargo space cover with integrated safety net. 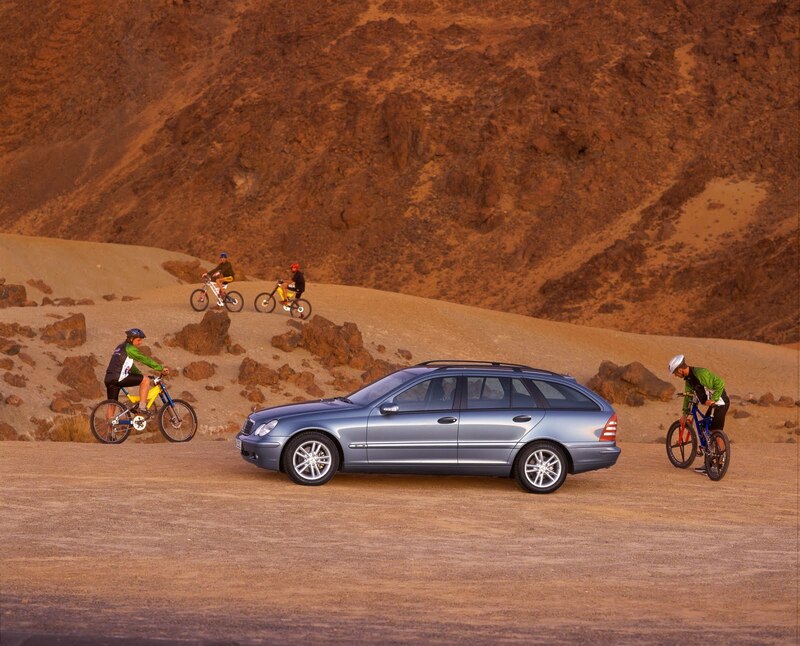 Another C-Class model featuring a completely new body variant made its debut in October 2000, even before the arrival of the Estate. Just four months after the Saloon went into production, Mercedes-Benz presented the new Sports Coupé from the CL 203 series at the Paris Motor Show. 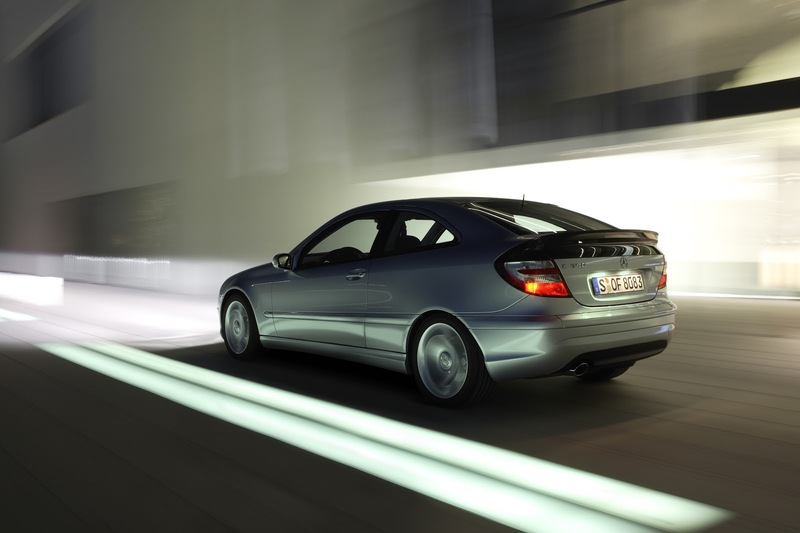 This independent C-Class model variant exuded agility, power and youthful charm. The characteristic louvered radiator mask with the centrally arranged star clearly identified the two-door Coupé as a new member in the club of sporty Mercedes-Benz models. This feature was complemented by the elliptic contours of the four headlights – even more distinctive than on the Saloon and Estate – and the powerful proportions of the body. The new arrival in the model series immediately presented a strong, progressive image. Compact dimensions and suspension lowered by ten millimetres compared with the Saloon characterized the muscular profile of the new model. The car was 4343 mm long, making it 183 mm shorter than the C-Class Saloon, and 20 mm lower, at 1406 mm. But the two-door Coupé was still very comfortable for four passengers. The characteristic feature of the completely newly developed Coupé styling was the high rear-end with integrated spoiler, and the dark-coloured trim strip between the tail lights. The Mercedes-Benz designers had deliberately used these distinctive contours to highlight the dynamic character of the two-door car. The styling of the rear-end was primarily based on functional considerations: the spoiler edge was set very high, ensuring excellent aerodynamic values at the rear axle in the interests of maximum handling safety, and the visually attractive trim strip also served as a window, giving the driver unusually good visibility to the rear. The optional panoramic sunroof provided even more interior transparency for driver and passengers, with glass all the way from the front windshield to the spoiler at the rear. At the push of a button, the front half of the roof slid back, opening up a third more roof space than a standard sunroof. The interior styling of the Sports Coupé was defined by aluminium trim, a three-spoke steering wheel with backlit controls for the car radio, car phone and other functions, and a sports-car-style cockpit. The C-Class Sports Coupé also introduced the newly developed SEQUENTRONIC automatic six-speed transmission as optional equipment. The new transmission was characterized by fast and precise gear changes, providing an even more dynamic driving experience, and also reduced fuel consumption. An electrical system transferred the driver’s gear change instructions to the transmission, eliminating the need for mechanical links and a clutch pedal. The same technical innovations already introduced in the Saloon also made the C-Class Sports Coupé a superbly agile performer and a treat to drive. Real sports car enthusiasts could turn to the EVOLUTION sports package with 17-inch alloy wheels, wide tires in size 225/40 R 17 (front and rear), lowered sports suspension, leather sports steering wheel and other high-grade equipment. 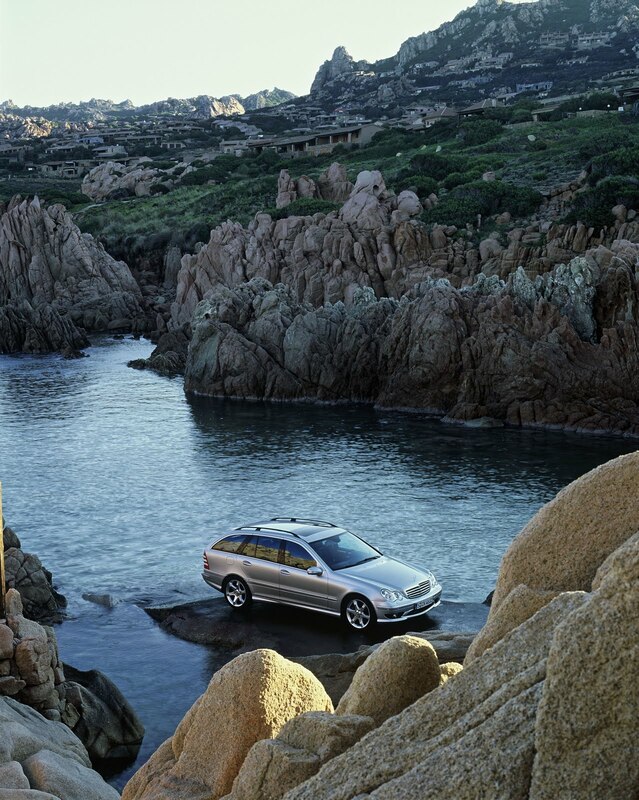 A wide range of innovations from Mercedes-Benz flagship models were also available as optional equipment. In the new C-Class, customers had a choice of three design and equipment lines: CLASSIC, ELEGANCE, and AVANTGARDE. The differences between them lay in the styling of body trim, special wheel embellishers or alloy wheels, and the choice of interior colours and materials. The most lavishly equipped variant was the AVANTGARDE with five-hole alloy wheels and wide tires in size 205/55 R 16 as standard. The interior featured high-grade aluminium trim and leather covers for steering wheel and gearshift knob. Premium quality was also clearly evident in the other two lines, with a harmonious blend of fine-wood trim and high-grade fabrics and other materials. For dynamic handling and driving pleasure, right from the introduction of the new model series, the range included seven new or further developed engines and three different transmissions, delivering up to 20 percent more power and an amazing 43 percent more torque than their predecessors – ideal preconditions for a dynamic motoring experience. The power output of the four spark-ignition engines (C 180, C 200 KOMPRESSOR, C 240 and C 320) and the three diesel engines (C 200 CDI, C 220 CDI and C 270 CDI) ranged from 85 kW (115 hp) to 160 kW (218 hp). 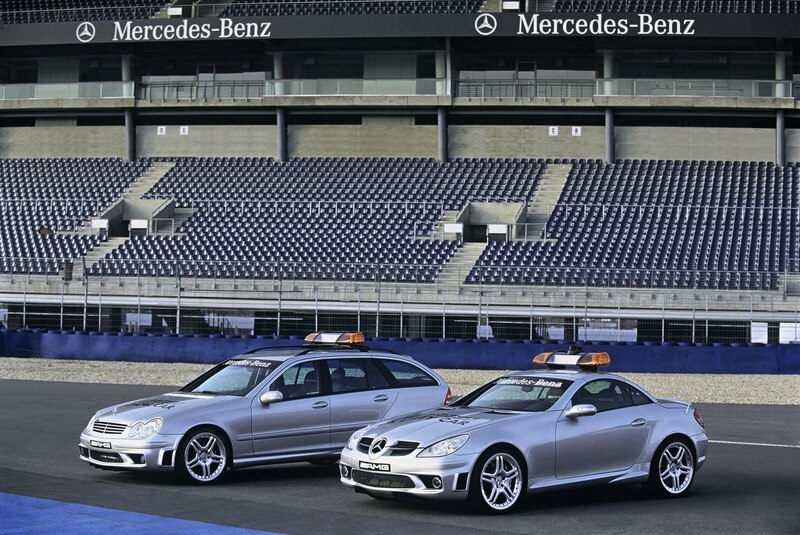 In October 2000, AMG completed the range by the addition of the C 32 AMG, delivering 260 kW (354 hp). Particularly when fitted with the newly developed supercharged two-litre engine, the C-Class was one of the most dynamic cars in its displacement category. The mechanical supercharger gave the four-cylinder C 200 KOMPRESSOR the performance characteristics of a large six-cylinder-engined car, with acceleration from standstill to 100 km/h in just 9.3 seconds, supported by its impressive torque of 230 Newton metres. The car had a top speed of 230 km/h while retaining exemplary fuel economy. Another innovation in the C-Class was the 3199-cc V6 engine with an outstanding output of 160 kW (218 hp) which clearly placed it at the top of this market segment. The new diesel models also had some highly impressive features: the five-cylinder C 270 CDI had a top speed of 230 km/h and was thus 27 km/h faster than the C 250 TURBODIESEL before it. This power boost was the result of a variable turbocharger and state-of-the-art common rail direct injection, which also reduced the fuel consumption of the new C-Class by 14 percent as compared to its less powerful predecessor. 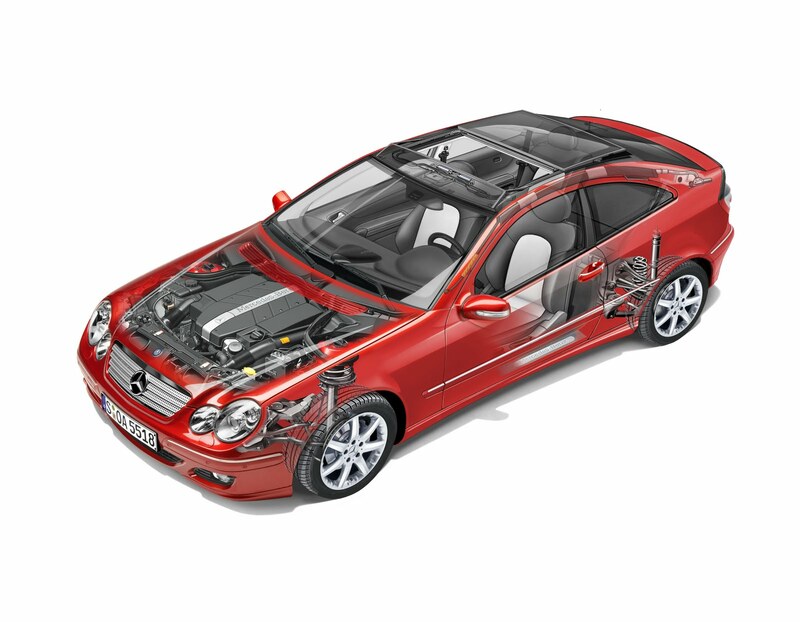 The same technology was also used in the four-cylinder C 200 CDI and C 220 CDI which again were both more powerful and more economical than the earlier models. In addition, a high-torque 2.3-litre engine with 145 kW (197 hp) made its debut in the sports coupé. 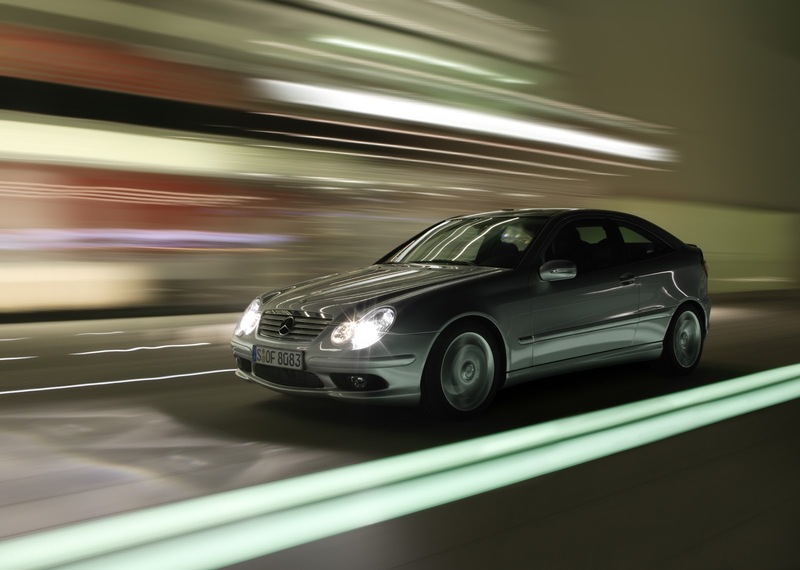 Powered by this engine, the C 230 KOMPRESSOR accelerated from standstill to 100 km/h in just eight seconds. The transmissions available, depending on the model, comprised the standard six-speed unit, the optionally available SEQUENTRONIC and the electronically controlled five-speed automatic. 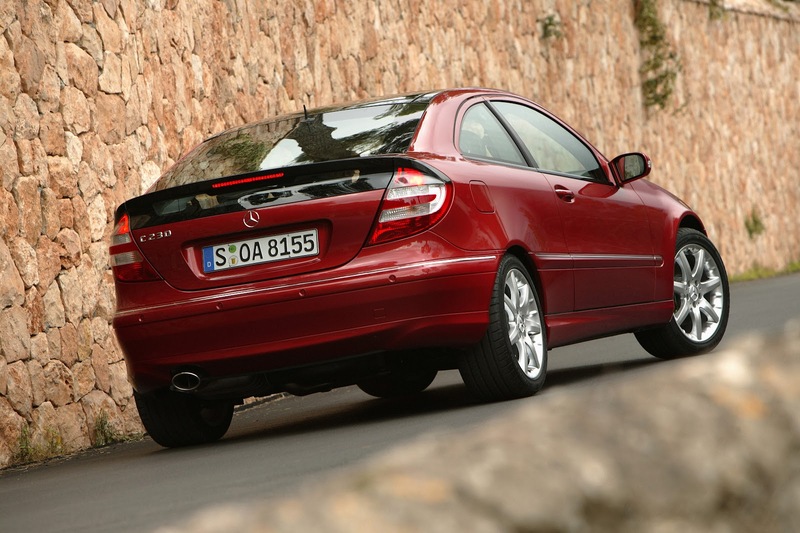 Mercedes-Benz launched refined versions of the 203 series on the market in 2004. The modifications were precisely tailored to requests received from customers. “C-Class production lines in Germany are now running at full capacity,” the manufacturer reported in the summer of the same year. The revised C-Class proved particularly popular with younger customers. Germany was the most important market for the C-Class with around 30 percent of all units sold, followed by North America with 20 percent. The model refinement package resulted in significant enhancements for the C-Class in terms of technology, equipment and design. For example, the chassis, steering and six-speed manual transmission were given a sports tuning. 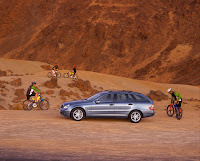 In spring 2004 a 141 kW (192 hp) four-cylinder Kompressor engine was added to the range of C 230 K Saloon and Estate models. The diesel direct injection unit in the C 220 CDI was fitted with the OM 646 engine, which now developed 110 kW (150 hp), giving it 5 kW (7 hp) more power than previously. 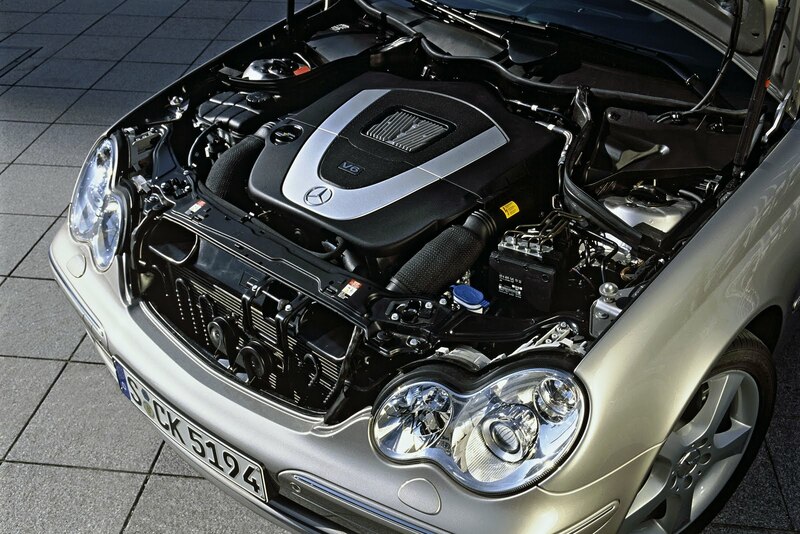 The 270 kW (367 hp) C 55 AMG was the first eight-cylinder engine in this model series. The interior was enhanced with a new cockpit design with attractive controls, line-specific seats and THERMATIC automatic climate control as standard. Standard equipment also included scratch-resistant paint derived from nanotechnology. Bi-xenon headlamps with cornering light function, steering wheel shift buttons for the automatic transmission and new audio and navigation systems rounded off the high-tech optional equipment features. The modified front end with bumper, radiator grille and headlamps emphasised the dynamic qualities of the Mercedes-Benz model series. 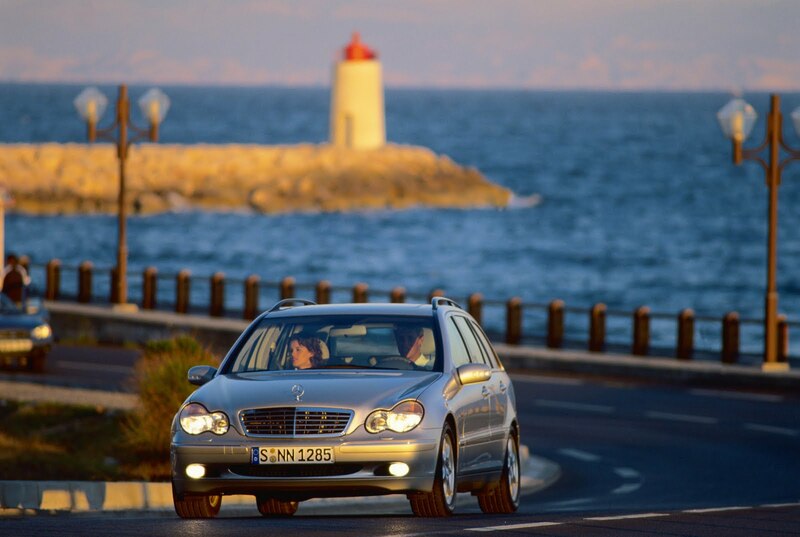 In 2005 Mercedes-Benz expanded the model selection in the 203 series with new engine variants. The centrepiece of these was the first V6 engine with quadruple variable valve timing from Mercedes-Benz: the technology package for this family of new six-cylinder units included variable camshaft adjustment on both the intake and exhaust side, a first for Mercedes-Benz in V6 engines. This ensured that the 24 valves opened and closed at the optimum moment in any driving situation, thereby significantly improving gas exchange in the cylinders and reducing energy losses. In the partial load range this technology also helped to reduce fuel consumption. Made of magnesium, the intake module of the V6 engines offered the possibility of varying the length of the intake manifolds in line with engine speed in order to maximise output and torque yield. The new V6 engine developed around 87 percent of its maximum torque of 350 Newton metres from as little as 1500 rpm. The crankcase and cylinder head of the new Mercedes-Benz six cylinder engine were made of aluminium. The intake ducts were fitted with newly developed tumble flaps, which improved the intake process and combustion of the fuel-air mixture. Under partial load they pivoted upwards, thereby increasing the turbulence of the gas flow in the combustion chambers. Under higher engine loads, the tumble flaps were completely recessed into the induction manifold. Thanks to this technology, fuel consumption of the V6 engine was reduced by up to 0.2 litres per 100 kilometres depending on engine speed – with a significant improvement in smoothness. In the C-Class the new V6 petrol engine was available in three output and torque classes: in the C 230 with 150 kW (204 hp), in the C 280 with 170 kW (231 hp) and in the C 350 with 200 kW (272 hp). The new C 230 with the innovative V6 engine was offered at the same price as the previous C 230 KOMPRESSOR. The new Mercedes-Benz C 230 had 9 kW (12 hp) more power than its predecessor. The new C 280 had an output of 170 kW (231 hp) and delivered maximum torque of 300 Newton metres from 2500 rpm. This represented an output increase of 45 kW (61 hp) compared with the previous C 240 – accompanied by an approx. 12-percent reduction in fuel consumption. 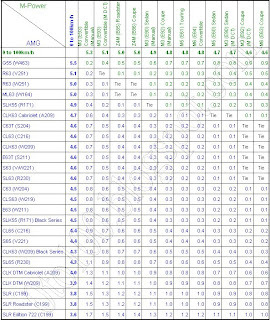 From spring 2005 the C 350 topped the standard C-Class models. Compared with the previous C 320 the six-cylinder generated around 13 percent more torque and 25 percent more output. Accordingly, the sportscar-like performance of the Saloon, Estate and Sports Coupé became even more impressive, with acceleration from 0 to 100 km/h taking just 6.4 seconds. The top-of-the-line diesel model in the C-Class was the C 320 CDI with its newly developed 165-kW (224-hp) V6 engine. This replaced the previous in-line five-cylinder unit (125 kW / 170 hp) and delivered a 32 percent increase in output. In combination with the optional seven-speed 7G-TRONIC automatic transmission, maximum torque increased to 510 Newton metres. This outstanding level for a six-cylinder diesel engine was already available from 1600 rpm and remained constant to 2800 rpm, which meant the C 320 CDI (Saloon) accelerated from 0 to 100 km/h in just 8.1 seconds. In early 2007 the new C-Class from the 204 series was launched and the last Saloon from the 203 series came off the production line on 14 December 2006. The iridium silver vehicle was destined for a customer in the USA. 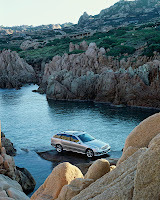 From 1999 to 2007 Mercedes-Benz built a total of 1,529,921 W 203 Saloons and 373,873 S 203 Estates. 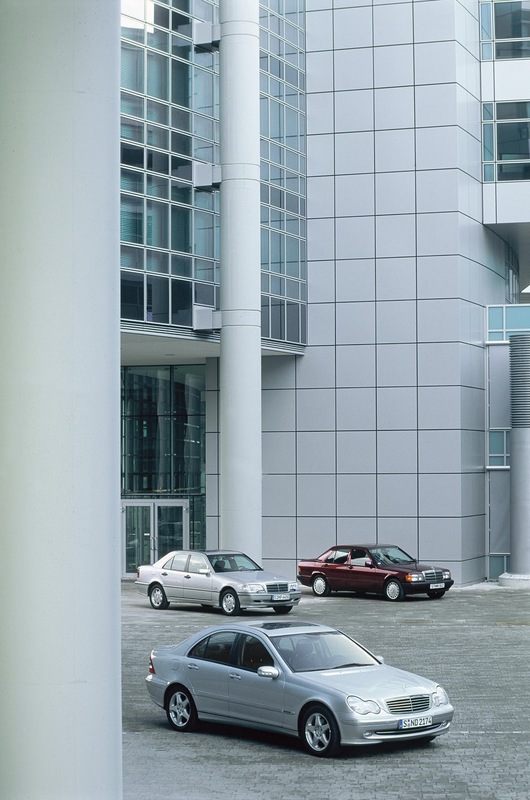 Production of the C-Class Sports Coupé from the CL 203 series was initially continued in parallel to the new C-Class from the 204 series as the CLC-Class.